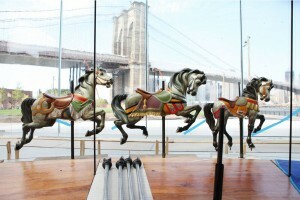 On Friday, September 16, a carousel built by the Philadelphia Toboggan Company (PTC) in 1922 for the now-defunct Idora Park in Youngstown, Ohio, will again delight ladies and gentlemen and kids of all ages, only now their view will be of the East River, Brooklyn Bridge and the Manhattan skyline. Idora Park officially closed its doors after 85 years on Labor Day 1984, after a fire in April devastated much of the park, including its famed 1929 wooden coaster, The Wild Cat. The carousel, scorched but intact, sold at auction October 20th of that year. It would have been just another sad story of how the decline of the urban manufacturing base decimated a local business until it was sold for scrap, but this merry-go-round got lucky. Each of its 48 horses and 2 chariots were sold individually, but at the end of the auction all the bids were tallied up and a single buyer was offered the opportunity to take the entire carousel for the combined sum. New York real estate developer David Walentas and his wife Jane bought Philadelphia Toboggan Company #61 for $385,000. 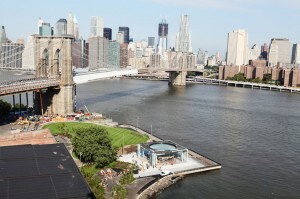 They were in the market because Walentas was developing a waterfront shopping complex in the Brooklyn neighborhood known as DUMBO (Down Under Manhattan Bridge Overpass). A rounded riverside spot seemed like the perfect place for an antique carousel so they went and bought them one. They hired a specialized company to dismantle PTC #61 and ship the whole shebang to Brooklyn, where Jane, who has a master’s degree in fine art, began researching carousel restoration. Instead of outsourcing, Jane decided to take on the massive restoration herself. It’s an incredible story of obsession and dedication. First she documented like crazy, taking pictures and samples and notes on the main parts of the carousel. 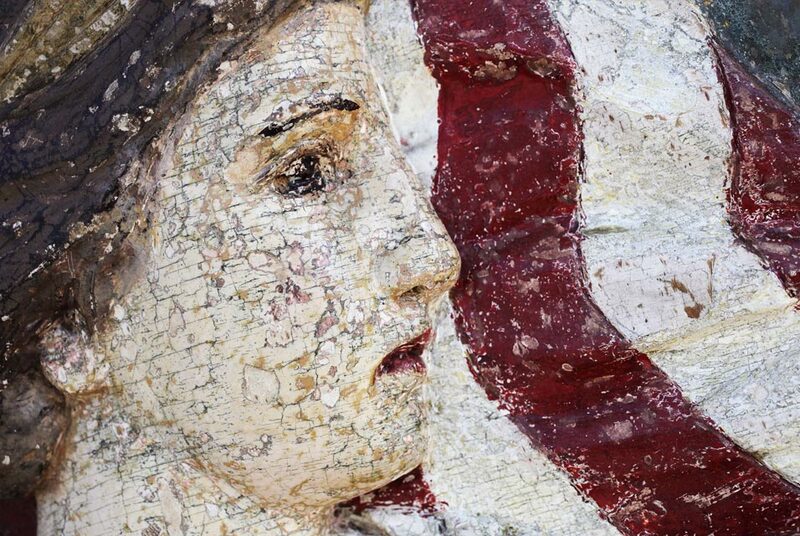 The original paint was unsalvageable so she sent the parts to a chemical stripper so the dozen layers of overpaint could be removed. Jane had a carpenter repair the parts, prime them and then set them aside in storage to focus on the stars of the show, the horses and chariots. I spent years, mostly alone, scraping the many layers of park paint to reveal the original palette and beautiful carvings. I had hoped to be able to keep the horses in their factory paint, but was eventually convinced that it was not possible. Much of the paint was fragile and the surface of most of the horses was rough and needed too much repair to have been left as they were. Once again, I did precise matches of the factory colors, and traced, drew and photographed everything I uncovered. I worked scraping paint off the horses, sporadically over the course of about 16 years. In June of 2004, the decades of work came to a head. She moved into a new studio, hired more help and set about doing all the repairs to the individual horses. Once repaired, they were repainted with painstaking fidelity to the factory original look, and then, because rich people are crazy, Jane took it a giant mommy step further and gilded all the horses’ metallic fittings and decoration, originally aluminum leaf or aluminum leaf with a gold wash, in freaking palladium and 24 carat gold. She also hired a luxury car customizer from Mercedes-Benz to do all the hand pin striping work on the horse bridles. 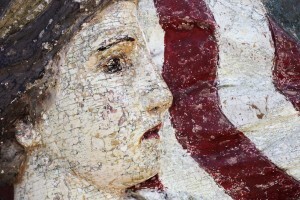 The two chariots, “Cherub” and “Liberty” she was able to keep in their original paint. After removing all the coats on top of it, the original paint was sturdy enough to stand on its own with just a little infilling. Although there’s a noticeable cracklure over the chariots’ surface, they still look fantastic even next to the freshly repainted ponies. 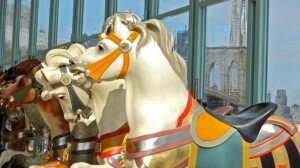 In 2006, the carousel was ready to be put back together and on display. Over the years the shopping center project had been scrapped to be replaced with a Empire Fulton Ferry Park, so the Walentas set up the carousel, now renamed “Jane’s Carousel” in honor of its obsessively loving foster mom, in another of their properties, a converted spice warehouse in the DUMBO neighborhood where people could see it among the art galleries but not ride it. 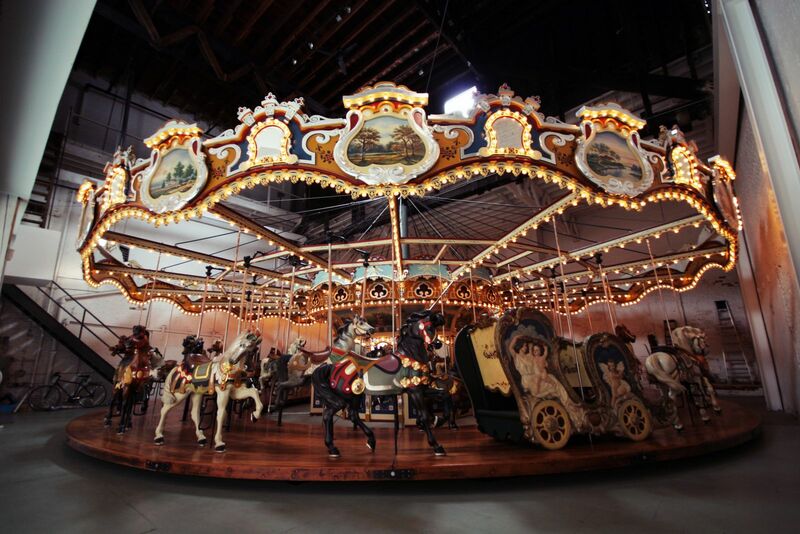 After some struggling with various committees, entities and civic groups, the Walentas got the nod to install the carousel on the waterfront in front of the Civil War-era Tobacco Warehouse. They hired French architect Jean Nouvel to design a suitable pavilion to house it and he created a $9 million transparent acrylic jewel box that would show off the beauty of the carousel during the day, show the riders a most spectacular view and that would at night be lit so that the horses cast huge shadows on the white floor-to-ceiling window shades. They also donated $3.45 million to the park for landscaping and nighttime lighting that will allow the park to stay open until 1:00 AM. Oh, and they donated a 1922 Philadelphia Toboggan Company carousel with palladium and 24 carat gold fittings. Now the jewel box is done, the parts and horses have been moved in, and as of Friday, Jane’s Carousel will be open from 11:00 a.m. to 7:00 p.m., every day except Tuesday. A ride costs $2, children under three ride for free. This entry was posted on Thursday, September 15th, 2011 at 11:58 PM	and is filed under Modern(ish), Treasures. You can follow any responses to this entry through the RSS 2.0 feed. You can skip to the end and leave a response. Pinging is currently not allowed. And meanwhile, Manhattan can eat its (alleged) heart out! Is the name “Philadelphia Toboggan Company” now in the public domain? I don’t think so. The company is still with us, although it goes by Philadelphia Toboggan Coasters, Inc. these days. I imagine they retain the trademark to their original name since they only changed it in 1991. Well…I guess that’s okay. I really didn’t want to make toboggans anyway! You just wanted the name, I understand. It is an extremely cool one. So it’s free for children under three to ride – but what if they’re really BIG? Like bigger than a four-year-old eh? You’re not planning on dressing like a baby and getting a really tall person to carry you just so you can ride the carousel for free, are you? Great story! I wanna go see it (and ride on it!) immediately. Many moons ago, my brother worked for several summers during high school as the carousel keeper-assistant at the also quite old and beautiful one they had (have?) in Forest Park in Queens, NYC. Helping kids get on and off the ride, and starting it up, making sure the music played, no one fell off, etc. No 24K gold leaf on that one, though! Plenty of fond memories of free rides for me! What a great summer job. I’m sure you made him resent it by the end of the summer, though, with your constant hanging around scrounging free rides. 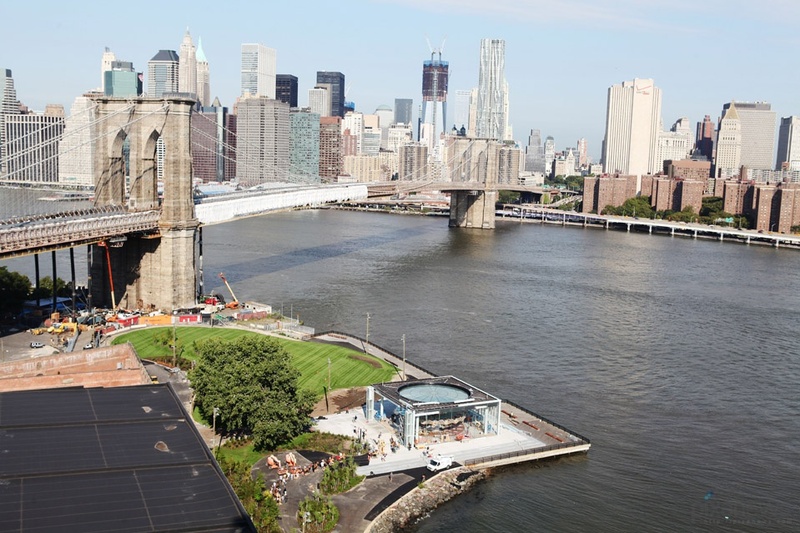 Anyway, it is wonderful that NYC now has a brand new carousel experience in DUMBO, and of course, the view couldn’t be more spectacular – overlooking the East River and the downtown Manhattan skyline. I imagine as many adults as children will be riding the thing! Ooh, I want to ride the tiger! I hope they get a management company in there stat because that is a beautiful carousel. It looks like it’s still in its original pavilion, too. When the Walentas purchased PTC #61, they left the housing behind. It was a plain wooden box, apparently, so they figured they’d just build another one in the new location. Hence the Nouvel-designed acrylic jewel box. My wife and I have riden that carousel when it was in Idora Park in Youngstown, Ohio. Thank you Jane for all your tireless work in restoration. We are glad kids…both big and small…can once again enjoy the magic of a carousel. How wonderful! May I ask when it was that you had the opportunity to ride the carousel in Youngstown? You and the missus simply must make your way back to it now that it’s in Brooklyn. An anniversary celebration, perhaps? Just realized I forgot to identify my comment so it posted as anonymous. We feel fortunate to have been a part of Idora history. I grew up close to Palasides Park and Bertrands Island in New Jersey. Fabulous memories. Thank you for preserving our American history. You must have had a grand time as a child so close to great amusement parks. That is a thing of beauty. Lady be crazy, but the results are spectacular. They are. There’s no debating it: palladium and 24K gold look better than aluminum. If it’s any consolation, the trademarked names are only trademarked for a specific purpose, much like how you can still paint a house yellow despite the fact that Nerf has trademarked it. So if you wanted to name your child Philadelphia Toboggan Company, then go for it! Nobody will be legally able to stop you. I’m actually amazed Frank Zappa hasn’t beaten everyone to that punch. I grew up in Youngstown and still live there, i went to idora many times every summer and rode the carousel, i was in new york a few days ago and went over to brooklyn and rode it for the first time in 28 years and yes i shed some tears wishing idora was still open and we still had the carousel but since we dont im glad it id where it is being rode on by a whole new generation and it more beautiful than ever, Jane did an amazing job so on behalf of the people in youngstown thank you for saving and restoring our idora park carousel!!!! How wonderful that you could relive one of your treasured experiences even though you had to go to New York to do it. How was the view inside the jewel box? Well I cannot say how thrilled I am to see this beautiful display. When I was young and I rode on this carousel at Idora Park in Youngstown, Ohio. I have so many great memories in that park and on this carousel which is called Jane’s Carousel. Jane you are very lucky to have a piece of my youth and a place I call home with you….Thank you for restoring such a great memory for me. Tammy K.
yes thankyou Im doing a history project on I dora park so interesting to read about!!! Thank God for you & your Hubby, Jane that you had the vision, dedication,and artistic talent as well as the resources to save probably one of the most beautiful carousels ever created. The horses are right at the top with Daniel Muller’s exquisite carvings but then a lot of them were probably carved by Mueller when he worked for PTC. For my money, he was the best of all the carvers with such great attention to detail & realism. You have done a great service for all who would have been deprived of this artistic jewel had you guys not stepped in & up to save this machine intact for future generations to appreciate the craftsmanship of “Old School”. So many beautiful carousels were either broken up & sold off piece meal – never to be publicly seen again or worse yet, just allowed to deteriorate into a useless state and subsequently destroyed. On behalf of a grateful (or at least should be ) country, Thank You from the bottom of our collective hearts ! You guys have set the benchmark for excellence.